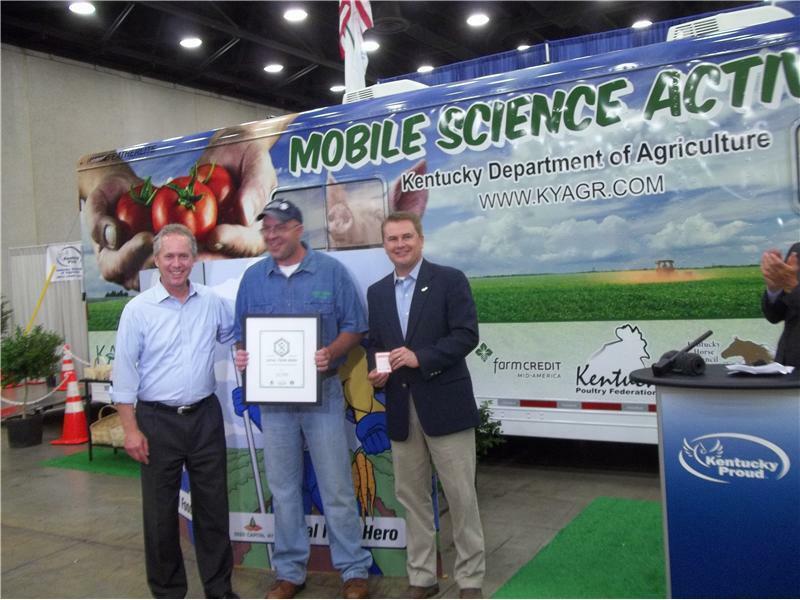 When Clay Turner of Logan County’s Turner Valley Produce learned that the mayor of Louisville would be one of those presenting him an award at the Kentucky State Fair Friday, he assumed that it would involve a relatively short appearance by the busy chief executive officer of one of the nation’s biggest cities. 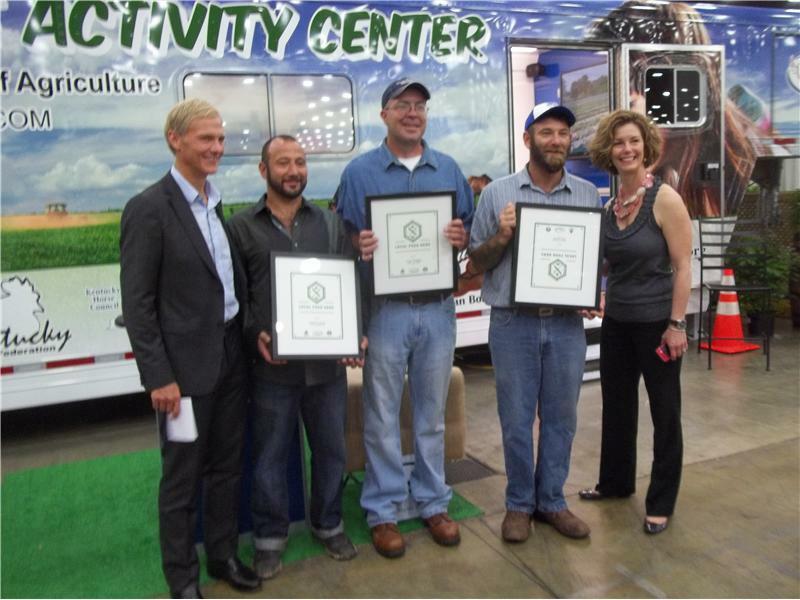 Kentucky Agriculture Commissioner James Comer and Louisville Mayor Greg Fischer recognized three of Kentucky's Local Food Heroes in a ceremony Aug. 23 at the Kentucky Proud section of the South Hall at the Kentucky Fair and Exposition Center. They are the first ever to receive this recognition. Mike Lewis of Gaining Ground Farm in Berea, Ramsi Kamar of Raising Hope Organic Farm in Louisville and Turner received awards for being the top vote-getters during the Local Food Hero online voting contest held in July. "Farmers are important to our state's economy," Commissioner Comer said. "The growing market for local food has enabled many farmers who are transitioning from tobacco to find a niche. This competition was a way for us to recognize their hard work and dedication." An active Monroe County farmer, Comer has become a respected advocate nationally for improving the market for diverse agricultural products. 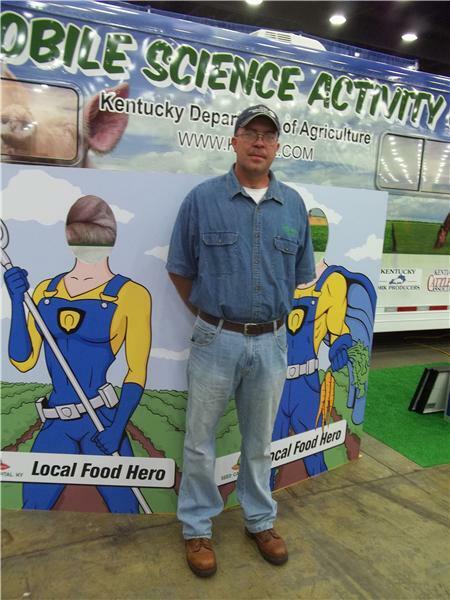 More than 2,500 votes from throughout the state were cast in the first Local Food Hero competition, which was made possible through the efforts of Seed Capital Kentucky, Kentucky Proud, the Kentucky Department of Agriculture, and Louisville Metro Government. Some 1,500 producers were eligible for the award, and these three emerged as the initial group of Local Food Heroes. "There are thousands of small farmers in Kentucky who produce food that Louisville and Kentucky citizens consume on a daily basis, and the Local Heroes contest has helped to raise awareness across the entire state not only about how important eating locally-grown food is, but just as much about the impact to the farmers who rely on people to buy and eat it," Mayor Fischer said. "Congratulations to all the farmers who were nominated." At the ceremony Friday, Turner, Lewis and Kamar were awarded plaques. They will appear on the field with Commissioner Comer at halftime of the University of Kentucky-Western Kentucky University football game this Saturday night in Nashville. "Local Food Hero" trading cards with information about each of the winners were distributed at the state fair and will be available at local food-related events throughout the year to continue to raise awareness about local food and celebrate the winners. Fischer is so concerned with providing safe, healthy, home-grown food for the people of Louisville that he was instrumental in the formation of Seed Capital Kentucky, which focuses on the local food economy, supporting farmers and leadership. Reily went on to say, ”While there is not one uniform definition of ‘local food,’ for most consumers it means food grown or processed within some specific distance (say, 150 miles) within Jefferson County.” That would include Logan County. The mayor added that farming should not involve “venture capital,” that those producing food for markets like Louisville need contracts with their customers. "I think this award is not so much about me, but about the environment we have collectively created that people know and care about locally grown food," said one of the Local Food Heroes, Mike Lewis. "Local food economies build strong communities." Turner Valley Produce is widely diversified in its vegetable production, but is moving toward primary emphasis on beans, peas, tomatoes, pumpkins and gourds. An ever-increasing volume of the farm’s produce is now headed to cities like St. Louis and Chicago, which send buyers to Kentucky for vegetables grown in Kentucky soil. Turner Valley has also been retained to be the supplier of large quantity of green beans for a meal sponsored by Kentucky Proud to let the public experience the benefits of eating locally grown foods. 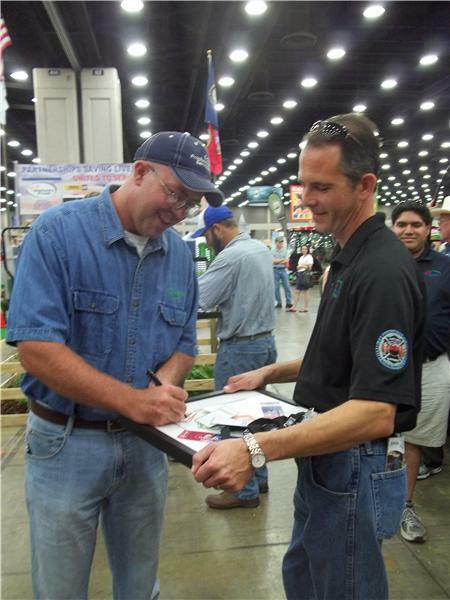 “We want people to know when they buy from us at our home stand or at farmers’ markets that the vast majority of everything we sell was grown on land my grandparents bought over 75 years ago,” said Clay Turner, who earned a degree in agriculture from WKU in 2006 after being named Chapter Star Farmer at Logan County High School. He farms with his sister Lindsay, who also is a graduate of WKU, and his mom Elaine, who holds a degree in family and consumer science from Lipscomb University. Turner Valley Produce was a leader in the formation of the Kentucky Wonders Garden Market on East Fourth Street in Russellville on Thursday afternoons. The concept is 1) to promote shopping downtown in an historic area, 2) to give people who want to walk to a farmers’ market (or not have to drive on the bypass) a place to get locally grown foods, and 3) to feature vendors who grow the items they sell instead of buying them for resale. Pat Foster, one of the vendors at the Kentucky Wonders Garden Market along with grandchildren Holly and Aaron Foster, wrote, “Clay is a very nice person who cares for his customers. He wants to make sure their wants and needs are met. He provides fresh vegetables for a large community. A very caring family.”.